Home / 2010 / Elections / Vote / Vote God / How much is your VOTE? How much is your VOTE? The Philippines is the only (majority)Christian country in Asia. People from other parts of the world think that Filipinos are honest, trustworthy, and God-fearing. However, graft and corruption is unstoppable among our so-called country leaders, from barangay up to the presidency. In ancient times, Malaysian and Chinese traders considered the Filipino traders as honest and most trusted. I recall that one of my uncles or grandfather used to talk about how much things have changed from their time and now with regards to values. Nowadays, the thing that we call "Conscience" has even been corrupted. Should you vote for a candidate which bought your vote just because "Na-consciencya ka na binigyan ka ng pera, kaya iboboto mo cya?" nagkakaroon ka ng Utang na loob dahil binigyan ka ng pera? So what is the difference between Christian and God-fearing people? A politician may go to church daily and yet he commits wicked deeds outside the church. A God-fearing person is one who is afraid of God at all times. We vote for a candidate without defining what his objectives should be and how he should be rated in the future. The aspirants shy away from quantified objectives because they do not want to be pinned down come judgment time. In the first place, they (or even we) don’t even have a clue on how to fulfill their campaign promises. Forums ask really vague or shallow questions and rarely challenged candidates (or the candidates are challenged and shy away from the question and give a different answer). This will probably lead us to choosing "The lesser Evil." Ironically, Issues and problems of our country are not even being discussed by our candidates since we, the people also don't raise it to them. Should we take it that these candidates will "Tapusin and Kahirapan" ; "Susugpuin ang Korupsyun" ; "Gawing Sikat ang Pilipinas" ; "Giginhawa ang Buhay" without really knowing (even a detailed plan of there 1st 100 days when elected) how they are going to do it? We must do our part to choose good and reject evil, including the "Lesser Evil." We must not just take there word for it, do research and use the LASER TEST on the candidates that you are supposedly Voting For. So how much is your VOTE then? For me, my vote is actually very expensive..this is not in terms of monetary value but rather it is worth my future or my children's future and even the generations to come. So, if someone wants or even tries to buy your vote, just look up the sky and offer a prayer; since it is not the just our country that is at stake but also your family, almost 100 million Filipinos and all the Natural Resources in the Philippines. Gusto mo ba ng GRASYA O DISGRASYA? Just say NO to VOTE Buying! Best blog post I've seen thus far in the Philippine community about the elections. I agree! 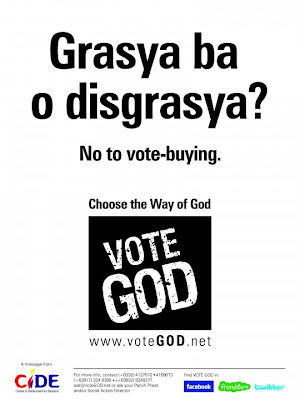 Let's say no vote-buying. I am writing about it, too.